It was one of those days. A poorly child meant I had a bad night's sleep and missed my 4.30am alarm call for a pre-work run. Up for work at 5.30am, home at 4pm to tend to the poorly child. Child to bed. Cooked fajitas for the husband. Really didn't fancy trying the warm chorizo and avocado that seemed such a good idea hours earlier; nor did I fancy another attempt at getting up at 4.30am so I decided for a quick run this evening. Home at 8.20pm and caught the end of the Great British Bake Off on iPlayer (well done Jo!) and toyed with the idea of just giving up on the challenge on day eight because I just couldn't be bothered. But then I found myself idly Googling five minute recipes. 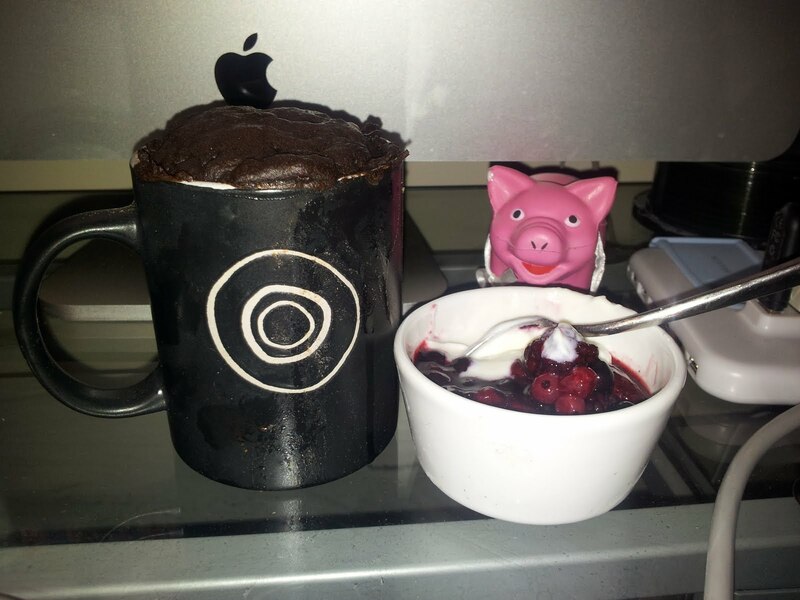 Most were the kind where you do thirty minutes prep and five minutes cooking or vice versa, but time and again I stumbled over a five minute chocolate cake in a mug. So what the hell. I gave it a go. And aside from it taking about thirty minutes for the mug to cool down so I could handle it (point of note - don't use an earthenware mug in a microwave if you don't want third degree burns!). It took longer to get all the ingredients out of the cupboard than to cook. And it's not bad for a five minute cake if you need a chocolate fix. So over the course of the year, I aim to find more five minute recipes that can be made from store cupboard ingredients. I already have the next one to try - Avocado Quesadillas. PS: Note the healthy yogurt and mixed berries accompaniment!